2-Way Ceiling Diffuser - Please contact us directly on 0161 336 5065 for bespoke products not listed as we specialise in made-to-measure vents and custom designs. Louvre faced ceiling diffusers with two-way blow blade configuration are constructed entirely from aluminium including the frame, blades and centre core. 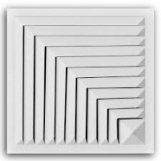 They provide excellent diffusion performance, and are suitable for surface mounting in plasterboard ceilings or lay-in ceiling grids (600mm x 600mm grid). 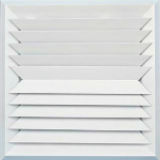 Select CVLFD2-450 for the tile replacement diffuser. CVLFD2-450: The overall face size is 595mm x 595mm. CVLFD2-450: The neck size for plenum box connection is 450mm x 450mm.